Gudi Padwa is considered as one of the most auspicious festivals in the country wherein people love to bring new things home. We have already seen in the past that the Maharashtrian New Year results into a spike in sales of cars and bikes, particularly in Mumbai. And, this year it won't be different either as several dealers across the city are offering heavy discounts and lucrative offers on bikes and scooters. 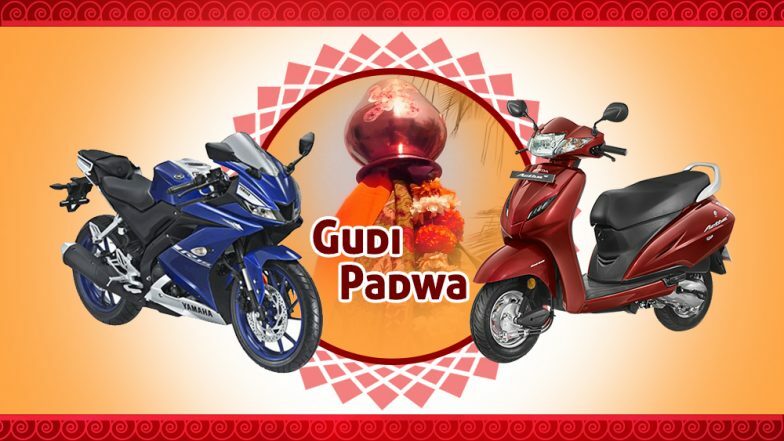 We list down of the attractive deals offered during Gudi Padwa 2019. Gudi Padwa 2019 Date: Know Significance of The Festival of Chaitra Sukladi, Which Marks Beginning of Hindu New Year. Yamaha R15 V3.0: The customers looking to purchase the 2018 version Yamaha R15 V3.0 can avail upfront discount of Rs 4000 along with exciting finance schemes. This special scheme is offered on the motorcycle as a part of Gudi Padwa 2019. This special scheme is offered at dealership levels and it will vary from dealer to dealer. Yamaha Fascino: Yamaha Fascino is another product that attracts exciting offers and benefits wherein the customers will get a chance to ride home the scooter with full tank. It is important to note that this offer is limited to selected dealers across the city and it may vary at dealership levels. The Fascino scooter will also be offered with free accessories such as guard, number plate and parking cover. Suzuki Gixxer: Suzuki Gixxer is one of the popular motorcycles from the Japanese bike maker that gets a discount of Rs 7000. This special offer from the dealership on Gudi Padwa also brings special deal on accessories. The customers will get free accessories on the purchase of Gixxer including leg guard, grip cover & parking cover. Honda Activa 5G: The customers looking to purchase the new Honda Activa 5G scooter, here is an excellent opportunity for them as the company is offering excellent deals during the festival of Gudi Padwa. The interested customers can avail low down payments of Rs 1,100, no-cost EMI and exchange bonus of Rs 2000. Moreover, attractive finance schemes are also offered from HDFC bank.